All her life, Moss has lived in the Tower of London with her father, who serves as the executioner for King Henry VIII. Prisoners condemned to death must face Pa and his axe—and Moss catches their severed heads. Her father insists he has no choice: if he leaves the Tower, he will be killed. But Moss can't bear to be the executioner's daughter any longer. When she finally finds a way out of the Tower, she discovers the river holds more dangers than she imagined—including the Riverwitch's curse. The Riverwitch once helped Moss's family in exchange for a terrible bargain; now she expects Moss to pay the debt. Moss hates her life at the Tower of London. Her father is the King's executioner and her job is to collect the decapitated heads and place them in a basket. She longs to be free of the horror but her father refuses to let her go. Then she finds a way out and goes on a search for the truth. Along the way she runs into a boy thief, Queen Ann Boleyn, and an urban legend figure that is very real. Only now she finds that there is a cost and she has to pay it. What worked: I'm a huge fan of the Tudors. 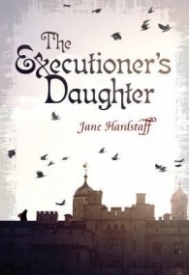 What really worked with this story is readers are able to see life in the reign of King Henry VIII only through the eyes of a twelve-year-old girl who isn't royalty and not a street urchin either. The life of that time isn't sugar coated but we see the harshness and cruelty that existed for those who weren't royalty. But even then? I loved the exchanges between Moss and Queen Ann Boleyn. We see that even being married to royalty didn't guarantee life would be any sweeter. I loved how Handstaff breathes life into an urban legend. In this case it's the Riverwitch who seizes children and drowns them. She's very similar to La Llorona of Mexican legends. Both have been wronged and both seek for the love of children, only to drown them. Moss is inquisitive, curious, and also despises her job of being the 'basket girl'. Then she gets to know the latest prisoner to face King Henry's wrath and his kindness pushes her to demand the truth of why her father has to execute the prisoners. The relationship between her and her father at first seems more controlling and only after he breaks down and admits to a deal her mother made at her birth do readers see the truth. I love the glimpses of the royal court gossip. In this case it's right before Queen Ann Boleyn is tried and executed for treason. When Moss accidentally stumbles unto one of King Henry's parties? Not only does she get a taste of the extremes of court life, but readers can see the subtle cruelties shown to those not in favor with the King. I personally feel mixing the historical with paranormal elements works. At that time of history, supernatural elements and superstition thrived, especially with the uneducated and poor. To contrast their plight with the cruelty and excesses of King Henry does work. Mesmerizing tale where the world of King Henry VIII meets an urban river legend. Readers will be caught up with not only the plight of Moss but court intrigues as well.